Medical College of Virginia, Richmond, VA 1968-1972 M.D. About David M. Pariser, M.D. 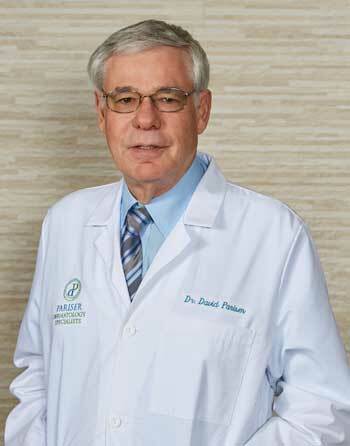 A practicing dermatologist for 40 years, Dr. David Pariser is the senior physician of Pariser Dermatology Specialists. He is a world-renowned expert on psoriasis, hyperhidrosis (excessive sweating) and photodynamic therapy, a treatment for early skin cancers and pre-cancers. He spends much of his time doing clinical research and has been involved in the development and testing of most drugs now commonly used in the practice of dermatology. A sought-after lecturer, he has been invited to teach other dermatologists at over 200 medical conventions in the US and around the word. His research work has led to the authorship of 4 textbooks and over 300 scientific publications in the medical literature. In 2009, his colleagues elected him President of the American Academy of Dermatology, the organization which represents nearly all dermatologists in the US and many from abroad. He has served in leadership roles in many other national and local dermatologic organizations and was voted as “Top Doctor” by Hampton Roads Magazine. Multiple national awards of recognition have been presented to him by the American Academy of Dermatology and the American Dermatological Association. He has been voted by his peers the Educator of the Year (highest rated speaker) by both the Fall and Winter Clinical Dermatology Conferences, a popular educational convention for dermatologists from the US and around the world. As a member of the Executive Committee of the International League of Dermatologic Societies, the world body of dermatology, he has participated in the operation and management of and has participated in teaching and patient care on multiple visits to a special facility in Tanzania which provides dermatology education and patient care to a seriously underserved population in sub-Saharan Africa. He has been interviewed and provided medical information to the public through media outlets such as the New York Times, Wall Street Journal, WEB MD and many other print and on-line media outlets which help to educate the public on issues related to skin health and disease. "A trip to the Doctor’s office is not a favorite human activity; but, when the trip is to Dr. Pariser, I can expect great service in a very pleasant atmosphere. Way to go!" "I love Dr David and all of the employees."